Do you work in a laboratory? If yes, do you often find yourself using electronic equipment while carrying out different experiments? One of the most popular and widely used electronic instruments in the healthcare and life-sciences industry today is the digital burette. Often used as an advanced alternative to the manual burette for carrying out titrations, it offers a number of advantages as compared to the latter. Titration is a technique where a solution of a known concentration is used to determine the concentration of an unknown solution. Typically, the titrant (the known solution) is added from a burette to a known quantity of the analyte (the unknown solution) until the reaction is complete. Since the volume of the titrant is already known, one can easily determine the concentration of the analyte. Often, an indicator is used to signal the end (end-point) of the titration. Environmental studies usually involve precipitation analysis and the response of precipitation to pollution. The degree of contamination of rainwater or snow is actually quantified using titration. This process tends to be quick and reliable. As most of the titration processes do not require expensive or specialized instruments, they can be easily done often and in different areas, with relatively little effort. The usability of water depends on its chemical ingredients. Once we have analyzed wastewater, we can easily determine the extent of contamination and the requirements for the filtering and cleaning of the same. Titration is one of the key steps in wastewater analysis. In this case, specialized titration equipment is used to measure the levels of ammonia in water in combination with other reactants in order to quantify other chemicals in the wastewater. The nutritional implications of food products can be determined by the compounds which make up these food products. For studies like these, titration is a technique that assists the analysis. For example, the acidity of orange juice can be easily measured by a standard titration process. Manufacturers use these techniques to alter these quantities, in order to satisfy customers or even create different varieties of products for those with special nutritional needs. The degree of acidity, also known as the level of tartness in a wine, greatly affects it’s flavor. This quality also plays an important role in deciding how the wine will respond to ageing. Therefore, just measuring the acidity of wine using titration can help improve its production. The process is pretty straightforward, uses minimal equipment and can be easily carried out by winemakers. The results of these titration tests suggest the requirements of additional ingredients to maintain the quality of the wine. The development of medicines is one such science that relies on specific measurements of chemicals. Thus, titration is one of the most important parts of the pharmaceutical industry that ensures quality control in medicines. Titration and many of its variations are used in the pharma labs, including various specialized instruments for pharma titrations that make the process even more efficient and accurate. Calorimetric Titration is a routine laboratory task that is typically taught while studying at a school or a university or while training. Traditionally, glass burettes are used to facilitate this process. This, at first glance, looks like a simple test procedure. In reality, if a titration is not performed carefully, it is possible that all the readings that you’ve recorded are incorrect and your entire experiment was a failure. There are several steps that might mess up the end result and must be done with vigilance. First, the burette, a glass precision instrument, must be clamped vertically. Then, the titrant must be filled vertically. Since this is a manual procedure, potential problems related to filling till a particular volume and also, depending on the type of the titrating solution, the safety of the user, might arise. Even the process of titration is not easy, as the correct titration speed has to be found, purely by hit and trial. Too slow, and the titration period is unnecessarily prolonged; too fast, and the equivalence point is exceeded. The valve tightness and security is a common challenge while using a glass burette. If not secured properly there will be leakage leading to inaccuracy. Final reading depends on the accuracy of reading the meniscus manually. Slight neglect in concentration can lead to inaccuracy. Once you’ve successfully carried out these steps, the correct value of the consumed titrating solution too has to be read accurately and then the final reading calculated. This clearly shows that there are numerous steps in a ‘simple’ titration experiment that can present themselves in the form of problems to the user. So, how do we improve this entire scenario? While using digital burettes, hazardous titrating solutions can be handled without worrying about spillage, thereby ensuring user safety. The titrant is raised using the knobs on both sides of digital burettes. The display can be reset to zero with a ‘Clear’ or ‘Reset’ button and the titration can then be started. The standard solution is dispensed by rotating the hand-wheels with care. By using the ‘Pause’ button, the titration measurement can be stopped at any time and resumed, as and when needed. An operating error is virtually excluded, since these burettes automatically recognize the direction of rotation of the hand-wheels, and thus whether the burette is filling or titrating. Their batteries can supply power for a year in case of typical applications. 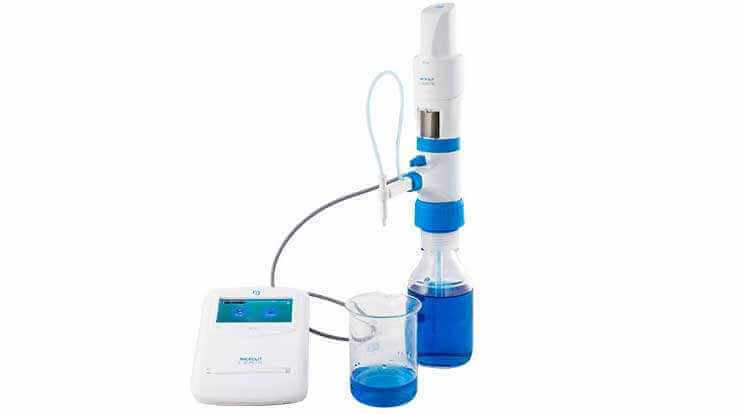 The digital burette can be used with most common titration solutions (max. 1 mol/l), such as sodium hydroxide, hydrochloric acid or iodine-potassium iodide solution. Certain digital burette models can also be connected to a PC for direct data transfer, thus, eliminating potential data transcription errors. In each data transfer, the burette sends the titrated volume, the serial number of the device, the nominal volume, the calibration offset, as well as the next calibration date. This way, a digital burette, minimizes the risk posed by multiple sources of error that might occur in titrations with conventional glass burettes. What is MICROLIT E-BURETTE and how is it better than Digital Burettes? 3 Calibrated Pre-Set Speeds to perform highly accurate titrations. Designed with ergonomics and intuitive handling in mind, MICROLIT E-BURETTE is widely used in industries like Pharmaceutical, Environmental Monitoring, and Food & Beverages. It exhibits excellent chemical compatibility and helps in performing precise titrations with reliability in practical laboratory environments. Microlit E-Burette comes with more bottle adapters (5) than any other E-Burette in the Market. The touchscreen control panel of E-Burette allows three pre-set speeds including drop-wise. This helps in achieving the endpoint very accurately. High-Speed Dispensing: Dispense at 1.517 ml/sec. Low-Speed Dispensing: Dispense at 0.491 ml/sec. Dropwise Dispensing: Dispense at 0.010 ml/sec. This is applicable to existing Digital Burettes where dispensing is done ‘Manually’ through a rotating wheel. The wheel rotation speed is not fixed and varies from user to user. These abrupt changes in speed lead to inaccurate and imprecise results. Motor controlled piston movement of Microlit’s E-Burette rules out manual-hand-wheel-operation and inconsistencies arising due to variations in user speed as it is individually calibrated at all three pre-set speeds. This eliminates human error making it ‘Real Automated Motorized Burette’. Recirculation Mode prevents the loss of reagents during purging by re-directing them into the mounted bottle and facilitates bubble free dispensing. FlexiNozzleTM is an adjustable delivery nozzle. It offers a high degree of flexibility in both the horizontal and vertical directions, facilitating easy dispensing in demanding laboratory conditions. A user-friendly TFT Touchscreen guides quick and accurate titrations and displays numeric data up to the second decimal. Keep the Stylus pressed against it to perform dispensing and lift it to stop at once. switch the instrument off, etc. The external components of the instrument are made up of specially selected glass filled polypropylene. This ensures high mechanical strength and high dimensional accuracy of components. Computer connectivity is available through a micro-USB cable for transferring and recording data. Conforms to ISO 8655 standards & GLP compliant. Each instrument is individually calibrated in Microlit’s NABL accredited laboratory (as per ISO 17025) and supplied with a calibration certificate. Five adapters: 28mm, 32mm, 36mm, 40mm, and 45mm are provided along with the instrument to fit almost all the laboratory reagent bottles. Easy power off from the touch control panel. A telescopic filling tube is provided which can be adjusted in length. The delivery nozzle can be adjusted both horizontally & vertically for different laboratory conditions. Rechargeable, long-life, replaceable batteries are provided in the control panel. E-Burette comes with a hand-held stylus which assists in perfect and easy touch operation of the control panel. Amber colored window is provided as an accessory for those chemicals/reagents that are sensitive to light.